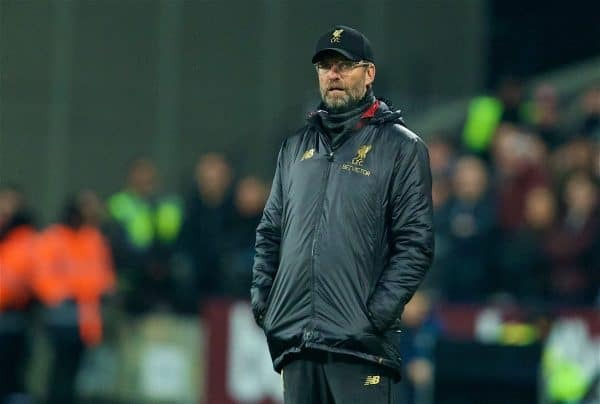 Jurgen Klopp described Liverpool’s 1-1 draw with West Ham as “absolutely deserved,” while offering a host of explanations for their disjointed performance. The Reds were held for the second game running as Michail Antonio’s clever strike cancelled out Sadio Mane‘s opener, reducing the gap between the Premier League leaders and Man City. Given those consecutive draws came against Leicester and West Ham is a bitter blow, with Liverpool having made a habit of comfortably dispatching of sides outside the top six earlier in the campaign. A fragility was on show at the London Stadium, but speaking after the game Klopp pointed to a host of new injuries to excuse this poor display. “It was difficult again, creating against so many legs, honestly,” he explained. “Yesterday night we trained, and after the session we had to change three positions. That’s, of course, not perfect. “You saw that around the set-pieces, especially with the organisation. “We struggled a bit, but apart from that it’s a game where if Divock scores the late goal [we are happy]. The manager elaborated further on the Reds’ lack of options, with Jordan Henderson and Gini Wijnaldum picking up knocks in the buildup and both James Milner and Virgil van Dijk suffering due to illness. “Milly was ill, or maybe he is still ill, I’m not sure,” Klopp continued. “And Virg had three, four days when he was out and lost four kilos, obviously that doesn’t help as well. “You have difficult situations, the centre-half position, the right-back position.